With Mazda’s Corporate Select Program, business owners can discover style and performance on competitive plans, with our passenger range of vehicles. Not only do customers get elegant passenger comfort and driving excitement, Corporate Select also offers outstanding value with 40,000km or 4 years (whichever comes first) of complimentary servicing on any Mazda6 or CX-3, CX-5, CX-8, CX-9 range of vehicle purchase under the program. We have a huge range of stock on display and vehicles available for test drive. Mazda accessories and exclusive Mazda Corporate Select pricing. – An eligible employee of a Corporate Select member company. Employees will need to provide evidence of being employed by a member company via an Eligible Employee Letter prior to having access to the program. 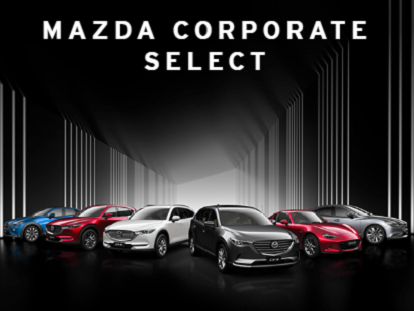 To be eligible to register as a company member of Mazda Corporate Select, the company must employ a minimum of 50 permanent employees and be approved by Mazda Australia.